Incredibly easy to make, these mini cannoli truffles have all the sicilian cannoli flavor delivered in a bite-sized version. Cannoli, literally “little tubes”, are a staple of Sicilian cuisine. 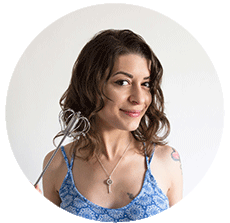 The recipes may vary, some come with candied fruit, others with a little cinnamon, vanilla or chocolate chips. 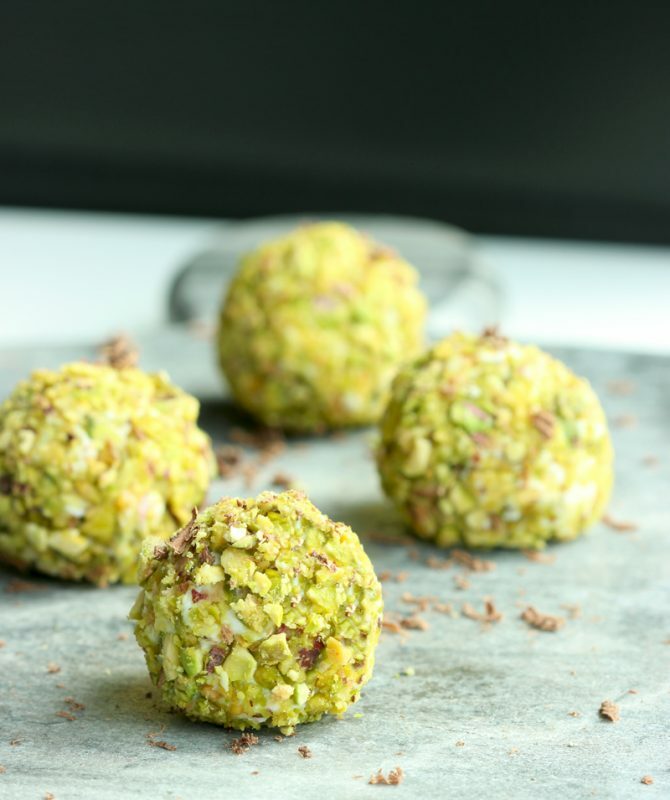 My favorite are the ones with chopped pistachios and I like a hint of chocolate too. They are the perfect dessert, crunchy & creamy, sweet but well-balanced, fresh and aromatic. I’m a HUGE fan of cannoli. I love the crunchy sweet shells but most of all the simple and delicious flavor of the ricotta filling. It all comes down to the filling to me. I would be OK (but still upsetting ) without the shells, but the filling, I can’t imagine my life without it. It’s by far my favorite cream filling for desserts and I often use it to make delicious cheesecakes. Rich, but low in calories and just a little sweet, ricotta is the secret to many beautiful savory dishes ( including my mum’s to die-for spring frittata), but it can also transform dessert into something luxurious while keeping it light at the same time. Cannoli are traditionally prepared with fresh ricotta cheese from sheep’s milk. Ricotta from cows’ milk has a milder flavour, but can be easily used as a substitute. When I don’t have the time to make homemade cannoli shells, these mini cannoli truffles are my favorite way to fulfill my weekly multiple cannoli-cravings ( yes, weekly and multiple, you read it right). They’re super cute and effortlessly easy to put together. 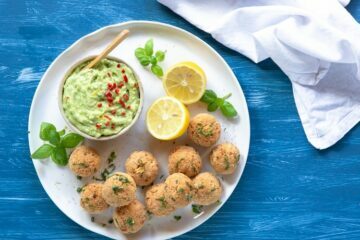 Loaded with sicilian cannoli flavor, these cute cheeseballs are perfect to share ( or not, and enjoy all by yourself!) and by omitting the shells, they also become gluten free! 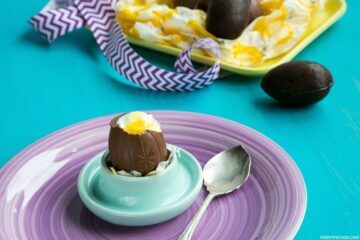 If you can find cannoli shells easily (or you want to try to make your own), break them up into pieces and serve them like tortilla chips with a big-sized version of these delicious Cannoli Truffles – It will make a showstopping party dessert! 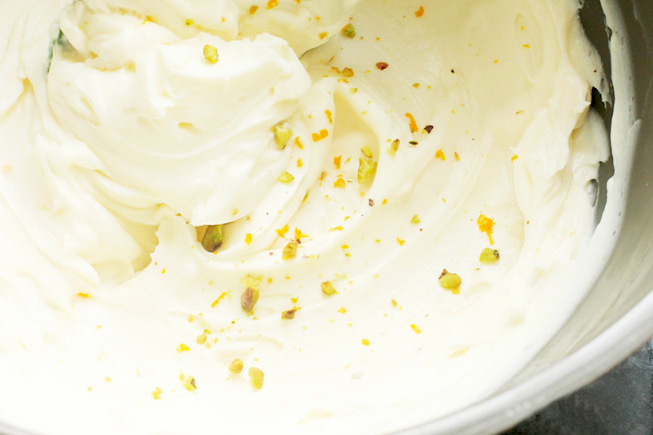 In a food processor or by hand, mix together ricotta, sugar, vanilla on low-speed. Beat the cheese mixture until you reach a creamy texture. Mix in pistachio and lemon& orange zest, and stir until combined. Refrigerate in the freezer for 15 mins. Transfer the ricotta cream into a piping bag. Pipe the ricotta into tiny balls, on a tray covered with parchment paper. Refrigerate the truffles in the freezer for 15 min. 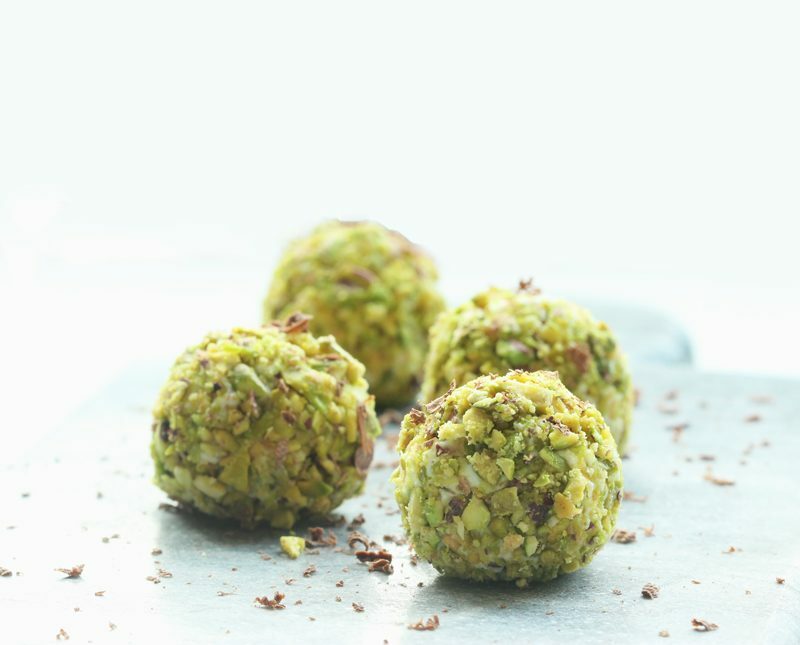 In a small bowl combine crumbled chocolate, cannolo shells (optional) and pistachio. 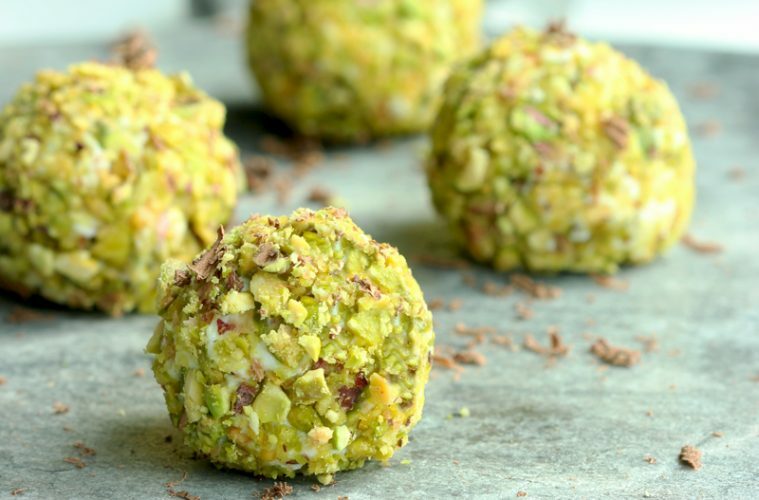 Remove from the freezer and dip each ball into the pistachio mixture, coating evenly the surface. 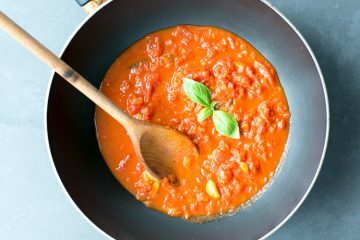 Serve immediately or keep in the freeze for max ½ day and remove 10 min before serving. Enjoy!